Our pre-school program is a non-profit outreach ministry designed to build a solid foundation based on Christian values for the children of our community and congregation. Our experienced and caring staff is dedicated to honoring God and sharing the love of Jesus with our students through a Christian curriculum. The information below will hopefully answer many of the questions that you may have regarding our program. If you would like additional information, please call us or email us. To enroll, please click here. Our programs aim to nourish each child’s personal needs and development with small classes and individual attention. Building social awareness by creating a sense of belonging and independence, nurturing self-esteem, and teaching respect for self and others. Intellectual and creative activities include math and reading readiness, art, music, and group discussions. 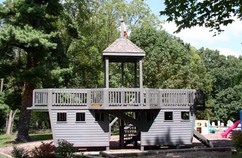 Physical activities include a safe outdoor play area, discussions of health and safety, and free play. Faith education based on Christian teachings include bible stories, songs, prayers, and dramatic play. Our preschool offers age-specific classes and a convenient schedule of programs. Some schedules are dependent on final enrollment. “2 by 2” class is designed for 2 year-olds and a parent or caregiver. This class provides social interaction for children and parents. Many learning activities are presented. “3’s” class is designed for 3 year-olds who celebrate their third birthdays before September 30th. This class provides children an introduction to preschool, with a focus on social skills and academics. “Pre-K 4’s” class is designed for 4 year-olds who celebrate their fourth birthdays before September 30th. This class provides Kindergarten readiness through small group instruction. All teachers are professionally credentialed in preschool education and are aided by qualified and experienced teaching assistants. A music program is provided for each age group. The preschool is administered by our director, Bonnie Kline, who is credentialed in Early Childhood education with many years of teaching experience, and a non-salaried Christian Preschool Council representing a variety of skills including parenting, teaching, and business. For more information or to make arrangements to observe a class, please contact Bonnie Kline, Director at (724) 263-2385 or (724) 941-9050 or email Bonnie.